Out of these four, Quality of light and transportability are my two most important factors, because when you are bumping into a shoot location with all you gear, you need to be able to get it where you need it with minimum hassle. Then once set up you want it to look as good as it can. I own a range of lights but I have a two types of light fixtures that get a lot more use than the rest of my lights put together, Lowel Tota-light’s and Dedolight DLH4’s. I have 4 Lowel Totas and 7 Dedolight DLH4 lights as part of my kit. The Tota’s are a great light because they are tiny but pack a big output of 800W. When they are folded up for transport they are almost indestructible. To get a beautiful soft light from these fixtures I normally run them with umbrella diffusers, but when in a small space when I want to control the spill I use a soft box. The Totas have a built in umbrella mount, but to run a softbox you will need to buy a speed ring. Dedo DLH4’s are a great light also because they are remarkably small light, they give you great creative control over the light’s output, they’re energy-efficient, and they are rugged. The DLH4 is a workhorse lighting fixture, in short they are the compact, hard light source to beat. 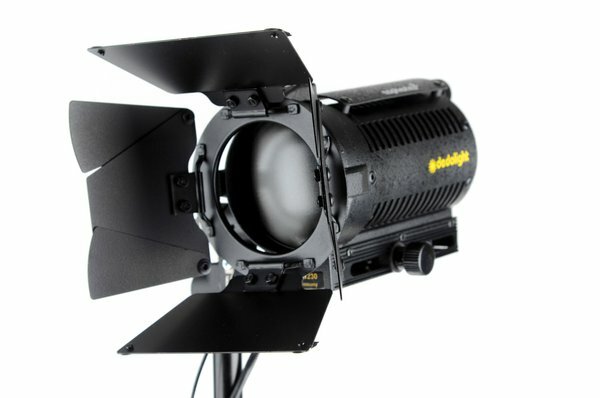 The Dedolight has a unique optical system using two lenses which produces an amazing focusing range and light efficiency and output, especially in the spot position. You can smoothly zoom the light from flood to spot simply by moving a slider back and forth along the length of the fixture effectively giving you unlimited options for focusing the light. Light output is smooth and even at all points. The Dedo DLH4 light head is small enough to easily stuff into small spaces and compact cases. At just over half a kg each, it’s also easy to carry a number of light heads around, or hang/rig the light in unusual places. My corporate light kit case has 5 dedos and 2 totas (and a 650w Arri Fresnel) as well as leads and dimmers, all weighing in under 25kgs. The lights run off mains power with either a 120v or 240v AC ballast which have a built in dimmer (on the power supply). The 100w 12v or 150w 24v halogen bulbs are very, very durable. You can knock the light off its stand to the floor, and still expect the bulb to keep working. The bulbs last a long time and they’re cheap to replace. The lights come with 8-leaf barn doors that give you fantastic control over the light. One of the things I love doing is creating shapes of light on the background, either thin crisp lines, circles or emphasizing an element in shot. That’s my run-down of my Dedo DLH4 light heads. They make fantastic accent and background lights, especially for shooters who want a versatile light that is easy to travel with.